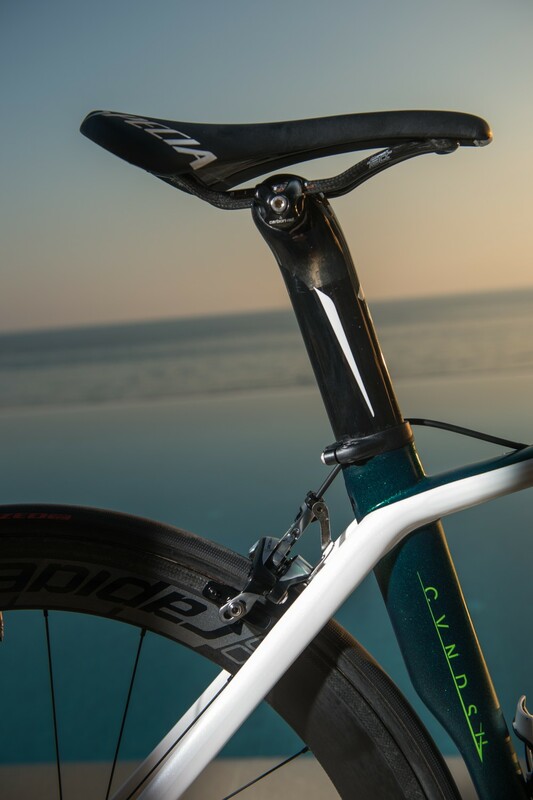 As Mark Cavendish prepares to begin his 2015 season, we took the chance to capture some snaps of the machine he’ll be using to try and win races this year, a custom painted 2015 S-Works Venge. The Manxman will be using the same CVNDSH white and glittery green colour scheme that made it’s debut in last year’s ill-fated Tour de France campaign, but the main changes come as the Etixx – Quick-Step team drops a long-time partnership with SRAM and begin using Shimano and FSA components on their bikes. 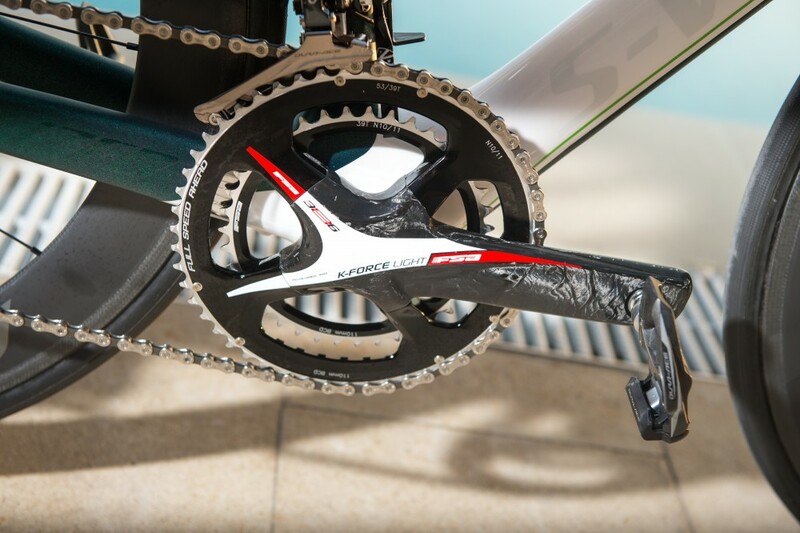 The FSA K-Force Light BB386EVO seen here is the Italian brand’s highest level chainset (it’ll cost you nearly a cool £600 for one of these full carbon sets), and allows for easier switch of chainrings because of the single 110mm bolt circle diameter. This means the mechanics will have a happier time fixing on compact or semi-compact rings for mountain stages. You’ll also notice that Cav (along with the whole team) is now using Shimano Dura Ace pedals, having used Look Keo Blade pedals previously. Cavendish will use a carbon FSA OS-99 stem but will keep with the pro tradition of using aluminium bars, with what we think are the Energy New Ergo editions. 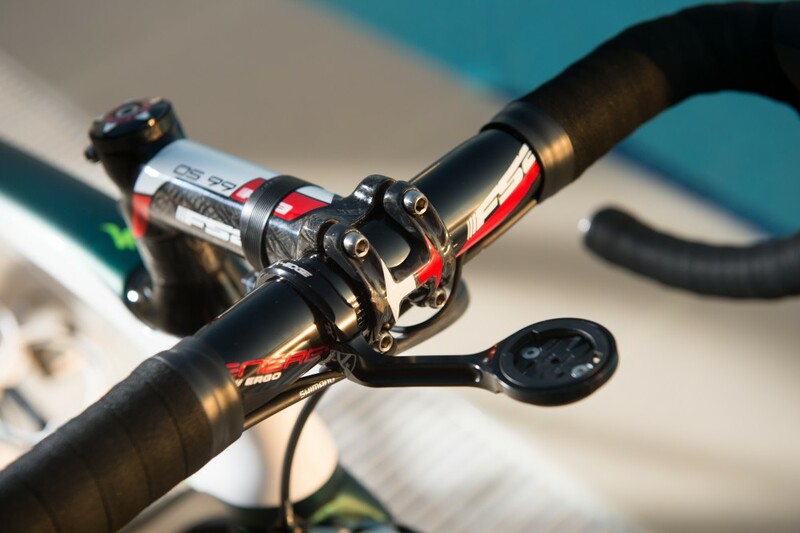 Attached is a K-Edge out-front Garmin mount. The team’s biggest switch this year is moving away from the SRAM Red groupset to using Shimano’s electronic Dura Ace Di2. 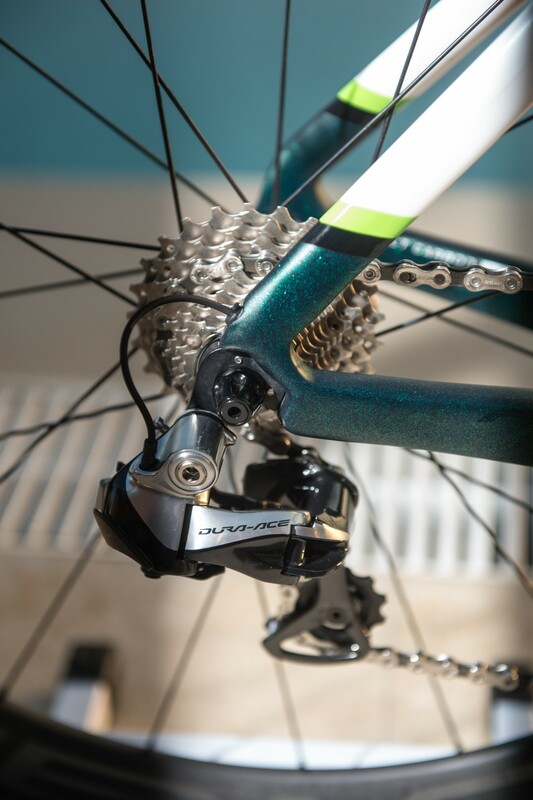 Aside from the chainset, the bike features Dura Ace throughout, for fast and reliable shifting that’ll mean the mechanics won’t need to worry about the annoying job of threading those cables through the frame anymore. With SRAM owning wheel manufacturer Zipp, Quick-Step has switched to using Specialized’s own brand wheels, Roval. Here, Cav is using a set of deep section Roval carbon tubulars with Specialized branded tyres. Dura Ace rim brakes are also on board after the switch to Shimano. The frame still contains the holes ready for internal cable routing, which are now redundant after the switch to an electronic groupset. 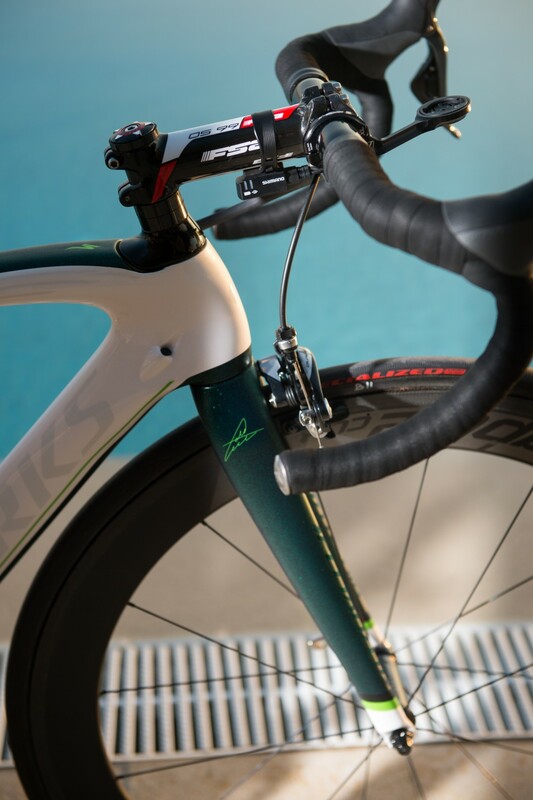 As this is Cav’s signature bike, his autograph dons the top of the fork. 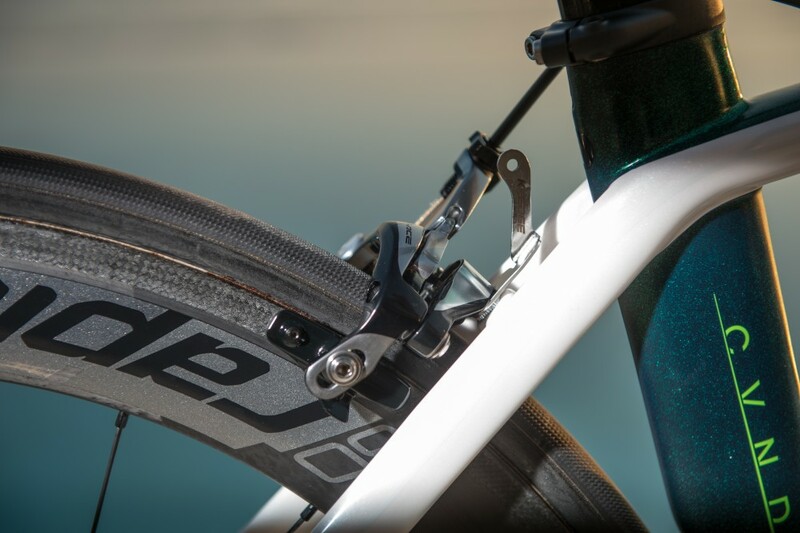 The Venge comes with a full-carbon flippable aero seatpost that can allow for two different set backs for the riders’ optimum position. Cavendish took his custom Venge out for a spin when we caught up with at the Etixx- Quick-Step training camp in Calpe, Spain, although look closely, an you might see he is using a different stem (which could be his old Zipp one) to the FSA stem featured in our photos.